Do you have a friend or relative who can't allow you or others to fully enjoy any experience because he or she is constantly asking "But what if...?" If so, that individual may be in need of the Bach Flower Essence Red Chestnut. Red Chestnut personalities appear to be caring and concerned, but that care and concern can be smothering, especially for children who need to experience new events and situations in order to grow. This is the mother who, because of her illogical fear of disease, won't take her infant child out of the house, and discourages anyone from visiting for fear they'll bring a virus or a germ. This irrational fear of disease has a name, Pathophobia, and can be successfully treated with this Bach Flower Remedy. This is also the mother / spouse / friend who is sure something terrible has happened if another person is late for a gathering or doesn't telephone at an appointed hour. Those suffering from the Red Chestnut state do feel pain and suffering because of their worries, but don't realize that their over-concern is inflicting pain upon their loved ones. They also fail to realize that focus on the possibility of negative events can energetically attract those events. The Red Chestnut state can occur when a symbiotic bond is not severed at the appropriate time. For instance, it occurs when the bond between a mother and an infant is not loosened enough to allow both to continue with their own growth. This flower essence is helpful for both mother and child when weaning. When one party becomes too dependent upon the other, both can be damaged. This is not to say that the bonds of love should be severed - merely the over-dependence of one upon the other. The Red Chestnut personality does not limit its care and concern to family members, but can project its worries and fears to friends and neighbors as well. Some whose professions cause them to identify strongly with others often fall temporarily into this state: for instance, nurses and counsellors. Few experience the Red Chestnut as a life-long state, but those who do suffer greatly. 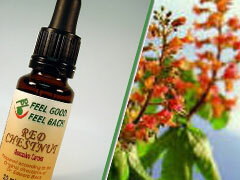 After treatment with Bach Flower Remedies, the Red Chestnut personality is able to project thoughts of security and well-being rather than worry. He is able to provide guidance and a positive influence without being intrusive, and is able to handle events in his own life with a cool head.